Temple Nile is one of a number of casinos from the White Hat Gaming group. It contains hundreds of games as well as a top-notch live casino. Despite being brand new, having been established in 2018, you really wouldn't know it because it offers a fully rounded collection of games, as well as many excellent features catering specifically to the player. Games are available on both mobile and desktop, together with 24/7 customer service for any questions. The site itself is a decadent one. As you might have gleaned from the title, the theme is one of Ancient Egypt and the Nile. The site is bedecked with golden jewels, pyramids and other artefacts from this ancient period, evoking a sense of the mystic as well as the luxurious. The setup is completely user-friendly, easy to navigate on both desktop and mobile devices, making transitions between the two platforms absolutely seamless. As we complete all the positives that make this casino so great, we should bring up the fact that this casino is fully licensed by the UK Gambling Commission. This is one of the strictest jurisdictions in the industry, and it means that, as a player, you're going to be well-looked after. The casino has to abide by strict rules and regulations all aimed at player safety, including responsible gambling outlets to help you. Online casino bonuses are one of the most important aspects if a casino plans to stand out from the rest. 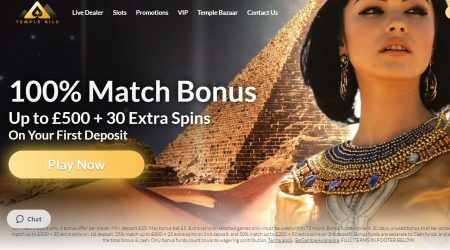 Temple Nile is no exception to this and offers an excellent welcome bonus that combines a match deposit as well as bonus spins. Better yet, this bonus continues when players make additional deposits. The welcome bonus is a lucrative one, offering a 200% match on any value up to as much as £500 when a first deposit is made. Players will have to create an account and then make a minimum deposit of £20 in order to qualify. If that wasn’t enough, this first deposit would also award 30 bonus spins that can be used to play on the Wild Scarabs slot, giving players ample opportunities for testing out the site and what it has to offer. As with all online casinos, there are some wagering requirements in place. These requirements are the play through values that players have to meet before they are able to make any withdrawals from their account. Temple Nile’s wagering requirements are a little steeper than most, sitting at 40x. This means that any winnings made from the bonus money must be played through 40 times before the money can be withdrawn. Failure to do so can result in the bonus money being removed from the player’s account. The welcome bonus, as well as offering the bonus spins, does have a continuation for second and third deposits. Each of these extra match deposit bonuses is set at different values. The second deposit pays out 25% up to values of £800 with the third offering 50% on values up to £200. There’s a chance to get your hands on more bonus spins, too – 25 on Gonzo’s Quest and 50 on Book of Dead. For those that are committed to the casino, there’s also a VIP programme to join. This comes in three levels – Silver, Gold, and Platinum. Each of them has its own perks, but all offer faster withdrawal times, additional bonuses and dedicated customer service. Of course, the higher the level, the better all these extras will be! 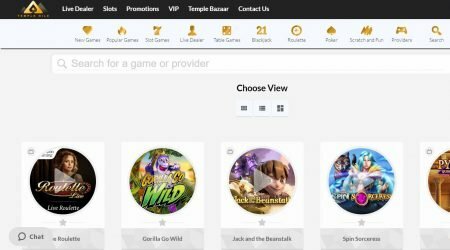 The game selection offered at Temple Nile casino is powered by some of the biggest developer names in the industry including NetEnt, Microgaming and Play’N GO. This enables the casino to offer a pretty spectacular array of games covering almost all genres. The slots are the largest game category available with a number of world favourites. Unsurprisingly there is a heavy lean towards Egyptian themed games with Coins of Egypt, Midas Gold and Pyramids being most notably present. There are numerous jackpot game options too. The virtual game choices are also worth checking out. 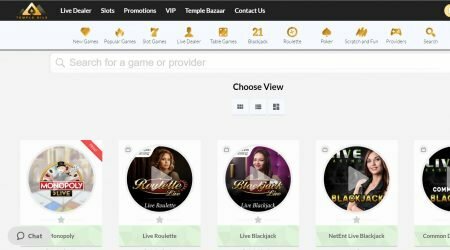 There are a number of versions of blackjack, roulette, and baccarat available. Video poker enthusiasts can also enjoy a wide range of fan-favourites, with Aces and Eights, Jokers Wild, and Jacks or Better, all available. When all this choice becomes a bit too much, there are a number of softer games available to play, as well. These include a collection of scratchcards that can be played for smaller amounts and are also accessible on mobile devices. The final part of the site is the live casino. This is run by the ever-exciting Evolution Gaming and NetEnt. The combination of these two powerhouse live game providers means you have access to nothing but the best. There’s almost everything you could wish for with a number of versions of blackjack, roulette and baccarat all available. Live Holdem, Caribbean Stud, Three Card Poker and Dreamcatcher are all available. The sheer number of tables and games on offer means there’s always a seat somewhere and a table limit to suit any budget. Temple Nile offers a wide range of payment options to players. When players wish to deposit or make a withdrawal, this level of choice makes things much more convenient. Deposit methods include Mastercard, Skrill, Visa, Neteller and Paysafecard. Deposits through any of these methods will be instant, with players able to access their account credit immediately. Players should note that payment options will vary depending on the country they are residing in. Withdrawals can be made through the same deposit payment methods, though transaction times will vary and be longer. There is a minimum withdrawal limit of £20 and it should be noted that GB Pounds is the currency used throughout the site, regardless of country of origin. However, there does not appear to be a list of withdrawal transaction times on the website making it a little unclear. Customer support is available 24/7 and is offered through a live chat service. Staff are prompt, friendly and helpful, generally resolving issues well. If you would prefer not to use this method of communication, then there is an email available, although this will take a little bit longer to elicit a response. With that in mind, urgent enquiries should be done through the live chat. The site itself is offered in a number of languages including English, Finnish, Norwegian, French, German and Swedish. The support system appears to reflect this with support offered in all of these languages. There does not appear to be a FAQ section available on the site which slows things down a bit as players must contact support staff when issues arise. Still, though, the customer care is fast enough making the missing FAQ less of an issue. Temple Nile casino is really an ideal way of getting into the luxurious atmosphere of the online gaming world. It is easy to use, with a highly intuitive interface that translates well across both mobile and desktop platforms. The game setup is excellent with the casino using numerous search categories, from type of game through to the provider. The welcome bonus offers a great kickstart to any player’s gaming, allowing them the chance to check out the site in full. For those planning on sticking around, the VIP programme is definitely worth it. Here players can accumulate points, trading them in for massive prizes once they have accrued enough. Prizes include Macbook Pros and deluxe holidays – the full list is available in the Temple Bazaar section. Strong customer service, excellent safety measures and a range of payment options put Temple Nile up there with the best. Who needs to travel to Egypt when you get it all right here!